Reflections on SG: Will Bus Service Reliability Framework Work? Land Transport Authority ("LTA") will introduce the Bus Service Reliability Framework ("BSRF") in a two-year trial to improve en-route bus regularity, and reduce instances of bus bunching and prolonged waiting times. Twenty-two bus services, which include a mix of long and short trunk services and feeder services, have been selected for the trial. The BSRF assesses the regularity of a bus service using the concept of Excess Wait Time ("EWT"). 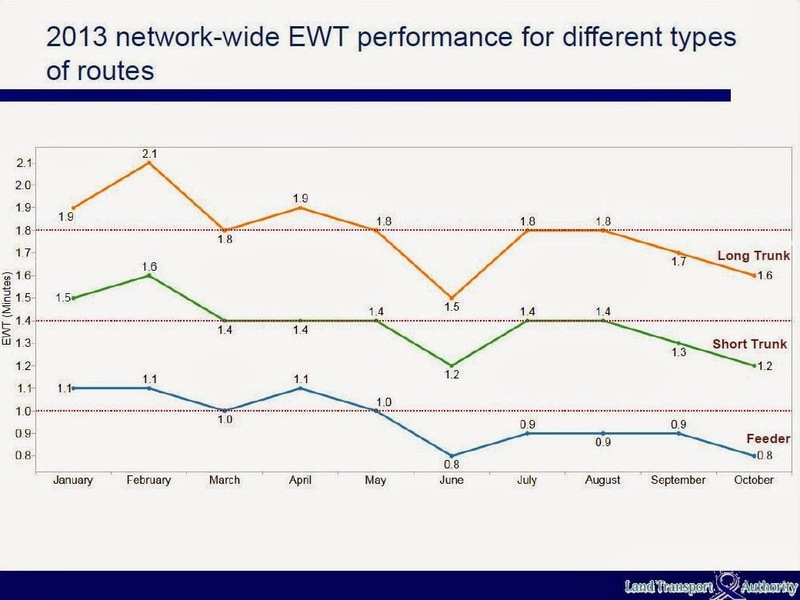 EWT is the average actual additional waiting time at selected bus stops for the respective services compared to the expected waiting time based on the buses arriving at regular intervals. EWT will be measured during both peak and off-peak hours on weekdays, excluding public holidays. Each bus service will have its own baseline EWT. Public transport operators ("PTOs") will be given incentives to reduce their EWTs. The incentives are calibrated in accordance with the efforts and operational costs involved in improving the reliability of the services. PTOs will be rewarded when they achieve improvements in bus service regularity, and are penalised if the service is not so. LTA believes that commuter safety will not be compromised as buses are required to adhere to speed limits and are installed with speed limiters. A basic tenet in management theory and practice is that the KPI (or key performance indicator) must be within the control of the person, department or organisation that is being rewarded or penalised. In the case of buses on scheduled services, the PTOs can control the bus departure times at an interchange or depot. ▪ Unpredictable road traffic conditions. ▪ Unpredictable commuter travel patterns. ▪ Unwillingness of commuters to move to the rear of a crowded bus, making it more time consuming for other commuters to board the bus. ▪ Bus bays being used by other motorists as parking or waiting areas, causing the buses to manoeuvre around them, especially when exiting the bus bays. ▪ Motorists not giving way to buses at Mandatory Give Way To Buses locations. Reducing EWTs is operationally challenging and the PTOs will require additional resources such as hiring more service controllers to manage bus services and having standby buses to inject mid-route if there are delays to buses which are already en route. Managing the EWT is much more complex than managing actual arrival times against scheduled arrival times. This is because managing the EWT requires the PTOs to manage a series of inter-connected arrival times throughout the day that are impacted by a range of factors (e.g., traffic conditions) that themselves are inter-related (e.g., adverse traffic conditions can cause arrival intervals to lengthen because of the build-up of commuters). 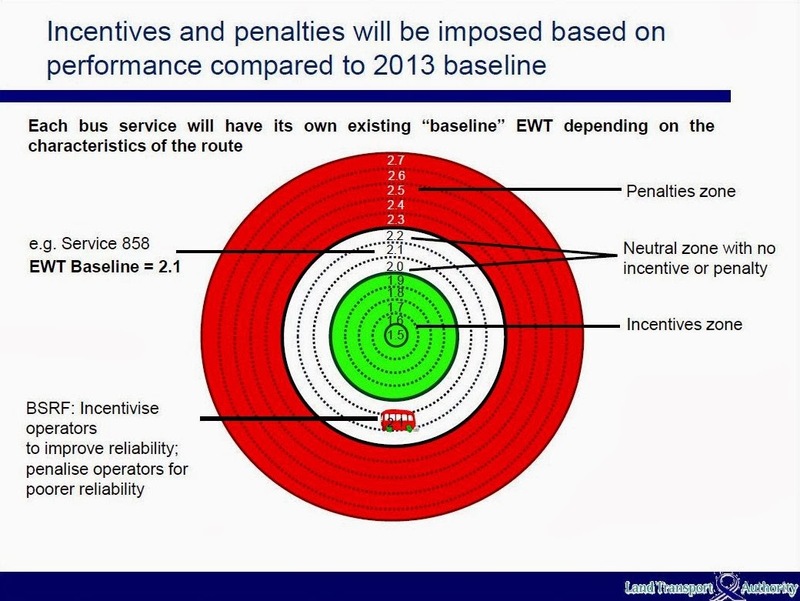 There is no assurance that any attempts to micro-manage individual EWTs (other than injecting a bus mid-route) will optimise overall EWT of that bus service or maximise net incentive less penalties. EWT should be computed as the median EWT instead of the average EWT. A high EWT resulting from a much delayed bus will skew the average EWT. This may explain why there are no negative EWTs in the following diagram (two other plausible explanations are: negative individual EWTs are ignored when computing the average, thus putting an upward bias to the average; and the standard wait times are unrealistically tight). In fact, in LTA's example (see diagram above), the incentive starts with EWT of 1.5 minutes. Recall that EWT is excess wait time! The baseline EWT is a historical EWT measured over the previous year. Traffic conditions may change, especially as the overall vehicle population increases over time. It is unclear whether LTA will use a 12-month or 4-quarterly moving average baseline EWT. LTA envisages that the PTOs can regulate bus speeds by having the bus slow down or hold at bus stops for short intervals, generally no more than about a minute or so, and only if it does not cause any obstruction. Causing a bus to slow down or hold at a bus stop for short intervals will likely obstruct traffic, especially other buses. Commuters will become irate if a bus travels at 20 kph, for example, when there is no obvious traffic in front of it, or if the bus is stationary at a bus stop for no apparent reason. 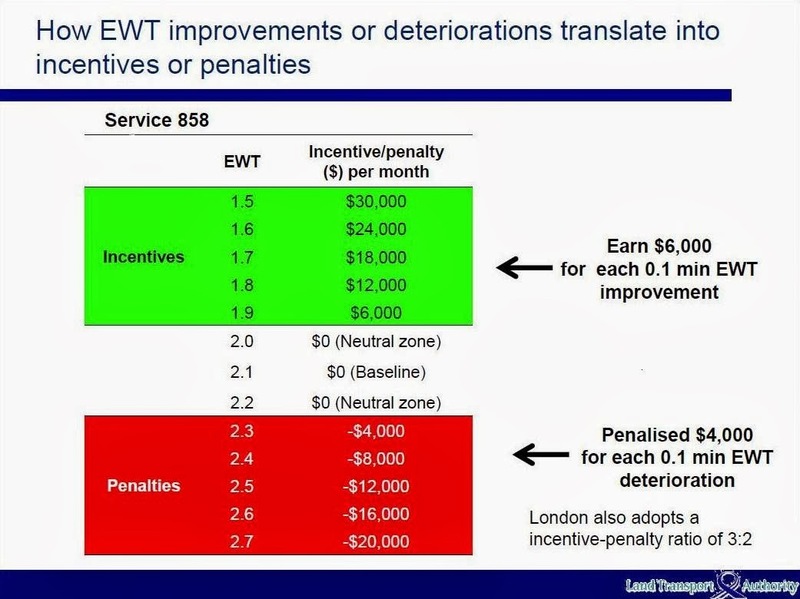 Bus drivers have little or no incentive to minimise EWT unless the PTOs share the monetary incentives with them. If the PTOs do that, will they also share the burden of the penalties with their drivers? Will EWTs be part of a driver's KPIs or a group of drivers' KPIs? Bus drivers may become impatient with, or less considerate toward, commuters who may ruin their EWT. These may be commuters who do not move to the rear of the bus, ask for directions, do not have their fare ready when boarding the bus, (seniors) do not get seated quickly, take their time to alight etc. 1. Joint News Release by the Land Transport Authority, SBST and SMRT - Bus Service Reliability Framework 24 Jan 2014.